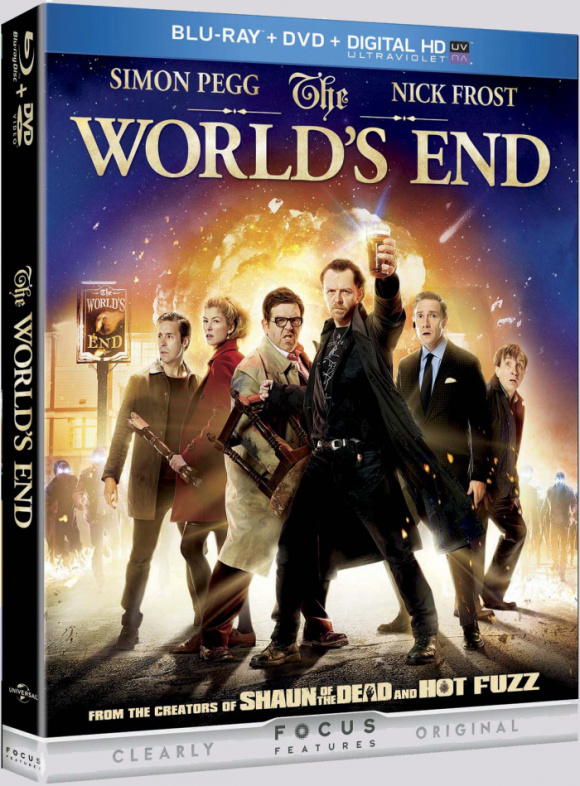 The Blu-ray™ Combo Pack of The World’s End includes a Blu-ray™, DVD and Digital HD with UltraViolet™. · DIGITAL HD with UltraViolet™ lets fans watch movies anywhere, on their favorite devices. Users can instantly stream or download movies to watch on iPad®, iPhone®, Android™, smart TVs, connected Blu-ray™ players, game consoles, and more. · Filling in the Blanks: The Stunts and FX of The World’s End – Cast and crew discuss the prowess of The World’s End stunt and VFX teams. Watch rehearsals of intricate fight scenes choreographed by some of the movies’ best stuntmen. Learn how the VFX team enhances the existing footage to perfect the film’s look and style. · VFX Breakdown – VFX Supervisor Frazer Churchill compares production footage with final shots to take viewers behind the veil of the outrageous visual effects sequences. · There’s Only One Gary King – osymyso’s Inibri-8 Megamix – A mash-up of Gary King’s (Pegg) best moments. · Signs & Omens – A film clip montage highlighting all the hidden clues and hints throughout the film. · Edgar & Simon’s Flip Chart –Writers Edgar Wright & Simon Pegg bring back the trusty flip chart to reveal their step-by-step process of creating the story. · Deleted Scene, Outtakes, Alternate Edits and more! · Completing the Golden Mile – The Making of The World’s End – While on the surface The World’s End looks like a movie about a bunch of old friends getting drunk on a pub crawl, it’s actually about much more. Look through the eyes of these frequent collaborators at the depth of the themes and the relationships between characters. Simon Pegg and Nick Frost reteam with director Edgar Wright (Shaun of the Dead, Hot Fuzz) in this wildly entertaining thrill ride that critics call “funny as hell” (Richard Roeper, WLS-AM Chicago) and “sheer comic perfection” (Peter Travers, Rolling Stone). Twenty years after their first epic pub crawl attempt, the “five musketeers” reunite in their home town to complete the ultimate challenge – one night, five friends, twelve bars – a boozy quest on which only the strongest will survive. But after a bizarre series of encounters with the out-of-this-world locals, they soon realize that reaching their final pub, The World’s End, may be the least of their troubles. They’re having the time of their lives, ready to take on the world… but tonight they may have to save it. Nicolas Angel (Simon Pegg) is a big-city cop who can’t be stopped – but he’s making everyone else on the force look bad. When he is reassigned to a small, quiet town, he struggles with this new, seemingly idyllic world and his bumbling partner (Nick Frost). Their dull existence is interrupted by several grisly and suspicious accidents, and the crime-fighting duo turn up the heat and hand out high-octane, car-chasing, gun-fighting big-city justice in this hilarious hit critics are calling, “Outrageous! Uproariously Funny!” (Thelma Adams, US Weekly). This entry was posted on Thursday, September 26th, 2013 at 10:33 pm	and is filed under Film, News. You can follow any responses to this entry through the RSS 2.0 feed. You can skip to the end and leave a response. Pinging is currently not allowed. I can’t wait to see all the cool extras on this! I love Simon Pegg almost as much as Jason Mewes and Wil Wheaton! « ‘Bob’s Burger’s Will Stay Open For A 5th Season!! !